Birdseed and grains have lots of calories, so they’re very attractive to bears. Removing feeders is the best way to avoid creating conflicts with bears. Bird seed has lots of calories — over 12,000 in a typical 7-pound feeder. So, bird feeders can be enticing sources of food for black bears. If you decide to feed birds when bears are active, you need to make your bird feeder bear-resistant. Visit the Keep Bears Out page for bear-resistant bird feeder ideas. 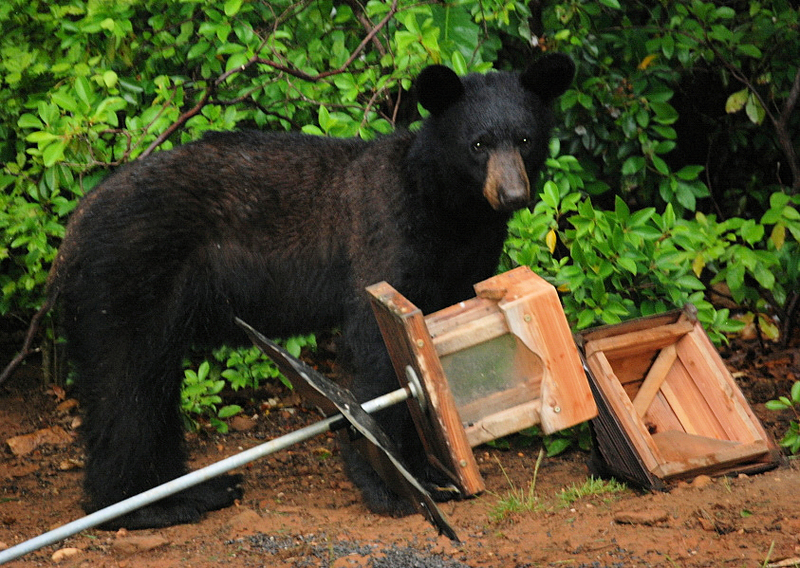 When bears are active, the best option is to remove bird feeders. However, bears in the temperate Southeast can be active year-round. Call your local fish and game agency to find out when bears are active in your area. While it is an enjoyable pastime, most wild birds do not need to receive food from people; they find their own food naturally, especially in the summer when natural foods are plentiful. In addition, feeding wild birds can cause them to change their natural foraging behaviors, become dependent on people, and can even increase their chances of getting sick, injured, or killed. Even if a bear can’t reach your feeder, the sight and smell will still attract them. Bears have been seen sitting under feeders for hours, trying to figure out how to get them down. While they’re thinking, they may look around to see if there’s anything else interesting at your place. Be extra vigilant and make sure you’ve thoroughly bear-proofed your home, garage, and property. Wild black bears are normally shy of humans and will stay away from people and their residences. However, readily accessible bird seed “rewards” bears for overcoming their natural fear of humans and makes them likely to return. In some states, feeding bears intentionally or even unintentionally is illegal, because it creates a dangerous situation for neighborhoods. Check with your local fish and game agency for wildlife feeding regulations in your area. Visit the Keep Bears Out page for bear-resistant bird feeding options. 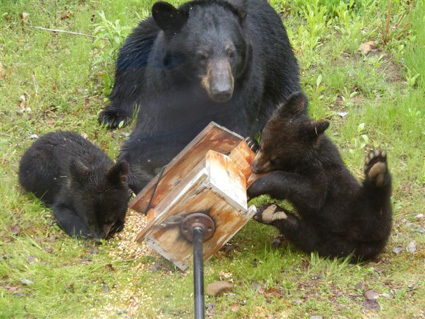 This mother bear and cubs with the toppled bird feeder are in trouble! Once bears find birdseed and other human-provided food, they face a much higher chance of being removed, are more apt to be struck by vehicles, or shot and trapped (illegally or legally). 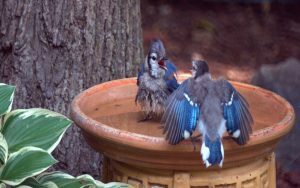 Water, either in a bird bath or as running water, can attract a wider variety of birds year round than a bird feeder. Nest boxes are important for birds these days, to make up for the loss of standing dead trees (snags) with natural cavities. Leave snags for birds whenever it is safe to do so. Add brightly colored, trumpet-shaped flowers to your garden, or buy ready-to-hang baskets of hardy annuals to attract hummingbirds, butterflies and a variety of beneficial insects. Native plants are hands down the best for supporting bird life. Your local nursery can recommend native species that will thrive in your area.